I purchased this tie soooo many years ago that I had forgotten about it! It is navy blue in color with Morris the cat (sort of orange/rust color). 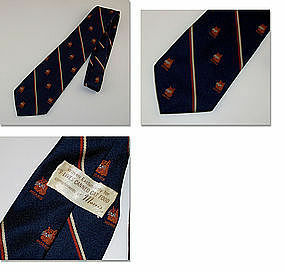 The original label is on the tie – see photo. Tie measures 4” wide (at the very widest part at bottom) and is 57 ½” in length (from point to point at each end of tie). Neat item that is not only wearable but is very collectible! Neat retro advertising premium given by Marathon stations! Silver color aluminum ice tongs, measure 8 ¾” long, has “New Marathon Gasoline, Best in the Long Run”, and has the “running man” logo. 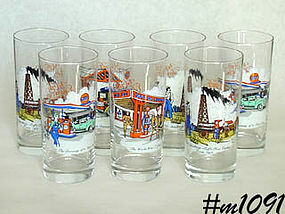 THIS LISTING HAS 7 TUMBLERS THAT WERE GIVEN AS PREMIUMS WHEN PURCHASING GASOLINE. MEASURE 6 1/4" TALL, THERE ARE 3 DIFFERENT DESIGNS -- "THE DAWNING OF A NEW ERA" (2), "THE WORLD WAR I YEARS" (2), AND "OLD SPINDLE TOP -- GULF'S FIRST GUSHER, TEXAS, 1901" (3). GLASSES ARE MINT CONDITION AND ARE FROM MY COLLECTION. NICE! This is a neat set of advertising premiums from Marathon! 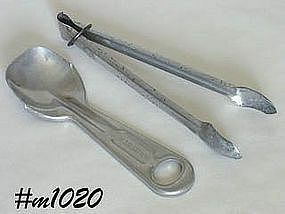 There is a shortening or ice cream scoop/spoon, silver color, measures 7 7/8" long, has "Marathon" on handle. 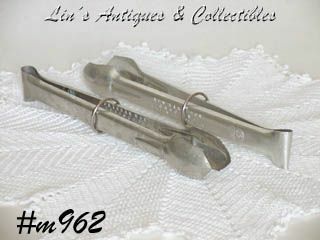 Ice tongs measure 8 3/4" long, silver color, have the "Running Man" and Marathon on end, center reads: "New Marathon Gasoline, Best in the Long Run". Spoon is in excellent condition, tongs have some discoloration caused by water minerals. Nice set, nice advertising pieces! NEAT ALUMINUM ITEM THAT IS ALSO AN ADVERTISING COLLECTIBLE! SILVER COLOR ALUMINUM ICE TONGS MEASURE 8 3/4" LONG AND STILL HAVE THE METAL RING TO HOLD THEM CLOSED WHEN NOT IN USE. THESE WERE APPARENTLY GIVEN AWAY BY MARATHON AS GASOLINE PREMIUMS. SIDE READS "NEW MARATHON GASOLINE, BEST IN THE LONG RUN" AND HAS THE "RUNNING MAN" EMBLEM. NEAT ITEM. I HAVE 2 OF THESE AVAILABLE. PRICE IS PER EACH.